Netflix is rolling out so many titles so fast that they have long since broke the barrier of presenting bad TV as well — something for everyone I guess. But the sitcom “All About the Washingtons” (Netflix, streaming), starring Rev. Run and his wife Justine, is a scripted variant of his own previous show “Run’s House” with a new cast of kids. it indicates that both the earlier show may have been more scripted than we suspected and that his hip hop legacy with Run-DMC may be be in peril if he brings this up. getting fierce criticism since the trailer began to appear earlier this summer is the series “Insatiable” (Netflix, streaming) in which pouty-lipped Debby Ryan plays a girl who loses weight and seeks revenge to those who bullied her, mostly by being a bully herself. That it has tonal problems is just the beginning of its problems. But the more high minded can indulge in a veritable “Downton Abbey” of sensibilities in the movie “The Guernsey Literary and Potato Peel Society” (Netflix, streaming) with many of the “Downton” cast including Jessica Brown Findlay, Lily James, Penelope Wilton and Matthew Goode in a British period piece set a little later in a post-World War II world based on a novel about a book club that started during the German occupation. There is a British cast to the adaptation of Agatha Christie’s “Ordeal by Innocence” (Amazon, streaming) as a series, with Bill Nighy, Alice Eve and Goode, again, among them. “Zion” (Netflix, streaming) is a documentary about a wrestler who has no legs. There’s other body part missing in the buddy comedy “The Package” (Netflix, streaming) about a teenage camping trip that goes very wrong. The brainy comic presents a standup special, “Demetri Martin: The Overthinker” (Netflix, streaming. “72 Dangerous Animals: Asia” (Netflix, streaming) looks at some fearsome creatures who are neither crazy nor rich, and then counts them. It sounds like the new culinary show that surveys pop-up restaurants “Million Pound Menu” (Netflix, streaming) goes after heavy stuff. The final of “The Great British Baking Show” (PBS, 9 p.m., check local listings) includes a couple of collapsed cakes. “Great Performances” (PBS, 10 p.m., check local listings) moves to the Second Dity with a performance at the Lyric Opera in Chicago that will include Renée Fleming, but also Broadway’s Jessie Mueller, the rapper Lupe Fiasco, folk’s John Prine, pop and gospel singer Michelle Williams, jazz singer Kurt Elling and the Rev. Jesse Jackson St. as guest presenter. Lawrence O’Donnell, Steven Pinker, Christina Bellantoni, D.L. Hugely and Seth Moulton are on a new “Real Time with Bill Maher” (HBO, 10 p.m.). There’s a golf tournament in Connecticut pitting NFL stars against those from the NBA for charity in “The State Farm Showdown” (TNT, 8 p.m.). Lee Daniels is profiled on “Breaking Big” (PBS, 8:30 p.m.). 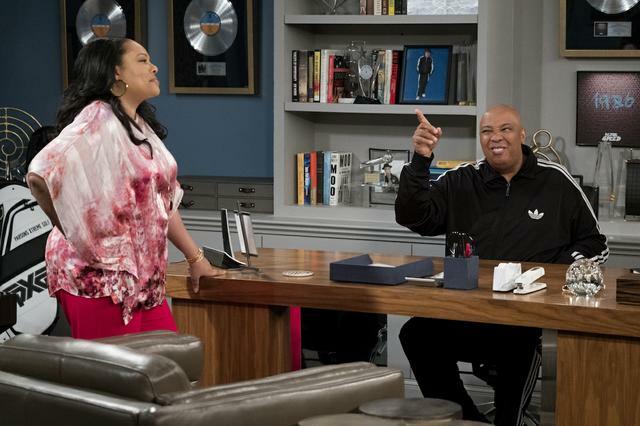 The reinstatement of ABC’s family comedy TGIF night begins with migrating reruns of “Fresh Off the Boat” (ABC, 8 p.m.) and “Speechless” (ABC, 8:30 p.m.). One might think from the title “Whistleblower” (CBS, 9 p.m.) is akin to the network’s action reality competition “TKO: Total Knock Out” (CBS, 8 p.m.). Instead, tonight’s episode is about a case against Los Alamos. “Wynonna Earp” (Syfy, 9 p.m.) visits her mom (Naomi?). Gold ore is found in an old wreck on “Cooper’s Treasure” (Discovery, 9 p.m.) but a storm is coming. D’av has a child on “Killjoys” (Syfy, 10 p.m.). “The Greatest Hip Hop Videos of All Time” (BET, 10 p.m.), covering 45 years, may go on for a while. “The Dead Files” (Travel, 10 p.m.) goes to Pinellas Park, Fla.
Dorothy Malone stars all day on Turner Classic Movies in “Saddle Legion” (6 a.m.), “Sincerely Yours” (7:15 a.m.), “One Sunday Afternoon” (9:30 a.m.), “Two Guys from Texas” (11:15 a.m.), “The Fast and Furious” (1 p.m.), “Convicted” (2:30 p.m.), “Tall Man Riding” (4:30 p.m.), “Tension at Table Rock” (6 p.m.), “The Tarnished Angels” (8 p.m.), “Written on the Wind” (10 p.m.), “Too Much, Too Soon” (midnight), “The Last Voyage” (2:15 a.m.) and “Tip on a Dead Jockey” (4 a.m.). Preseason football includes Atlanta at Jets (NFL, 7:30 p.m.) and Detroit at Oakland (NFL, 10:30 p.m.). Baseball includes Milwaukee at Atlanta (MLB, 7;30 p.m.) and at least 12 hours of Little League (ESPN, 11 a.m.) starting in the morning. There may be something similar in the quarterfinals of the Jr. NBA World Championship (Fox Sports 1, 2 and 7 p.m.). The WNBA has Indiana at Phoenix (NBA, 10 p.m.). Second round play comes in the PGA Championship (TNT, 2 p.m.). And it’s the quarterfinals in the U.S. Women’ s Amateur (Fox Sports 1, 4 p.m.). And cycling’s Tour of Utah (Fox Sports 2, 3:30 p.m.) reaches stage four. Kelly Ripa and Ryan Seacrest: Rainn Wilson, Shayna Taylor, Katie Lowes. The View: Alexandria Ocasio-Cortez, Sebastian Maniscalco, Mike Colter (rerun). The Talk: Kyle Richards, Gerrad Hall (rerun). Harry Connick: Matt Wright, Jamie Lee (rerun). Steve Harvey: Snoop Dogg, Charlie Wilson (rerun). Ellen DeGeneres: Samuel L. Jackson, Jennifer Lawrence, Dan Reynolds, Lauren May (rerun). Wendy Williams: Lauren Ash (rerun). The Real: Chrissy Metz, Thunder from Down Under (rerun). Stephen Colbert: Michael Moore, Eric Andre, Derrick Beckles, Alexandria Ocasio-Cortez, Jon Stewart (rerun). Jimmy Kimmel: Kim Kardashian West, Hayley Atwell, Train (rerun). Seth Meyers: Amy Adams, Henry Winkler, Simon Rich, Taylor Gordon (rerun). James Corden: Bill Hader, Gabrielle Union, X Ambassadors (rerun). Carson Daly: Omari Hardwick, Youngr, Matilda Lutz (rerun).